My Day as a Robot | Where It's AT. The Ability Tools Blog. Resistance to assistive technology is futile. As a sci-fi nerd, I have to make a Star Trek reference whenever I talk about technology and disabled people. The disability community is living in the darkest timeline right now, at least that’s what it feels like under the current Administration in the United States, and at the same time we are living in an age of the Internet, social media, and technology that revolutionized the way we connect, communicate, and participate in social life. While activists continue to fight for disability rights and against attacks on the safety net and multiple marginalized communities, it’s important to take time and reflect on the amazing fun things that happen to all of us. This is one of my stories. Three years ago I was invited to the White House for a celebration of the 25th anniversary of the Americans with Disabilities Act. At the time, I served as a member of the National Council on Disability and launched the Disability Visibility Project® the year before. The DVP is a community partnership with StoryCorps and an online community dedicated to creating, sharing, and amplifying disability media and culture. I don’t travel anymore by plane for a number of reasons and did not plan to attend. This is a fact of life and it took some time for me to adjust and reconcile. It’s a major bummer to miss meetings, opportunities, and social events because of my disability (and larger systemic factors) but I’ve reached a place where I try to focus on ways I can participate remotely or behind-the-scenes. 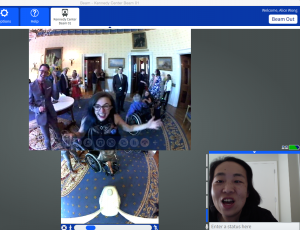 Maria Town, who served as Senior Associate Director for the White House’s Office of Public Engagement at the time, followed up with me and told me that I could attend the event thanks to arrangements they made allowing me to use a Beam Pro Telepresence Robot. I presumed I couldn’t attend and didn’t even think to ask for an accommodation. I was incredibly touched and thankful to Maria and everyone involved with the event who made this possible. A telepresence robot looks like a computer screen attached to legs with a base and wheels. Using my laptop at home, I could see everything with their webcam and everyone could see/hear me as well. I could independently move around physical spaces by navigating the arrows on my keyboard. It was very simple to use. Of course, I started live-tweeting my experiences, capturing screenshots of what I saw during the event. This was a major adventure and I had to document it! 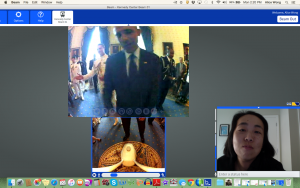 I got to ‘walk’ around the Blue Room and Green Room while waiting in a queue to meet President Obama. This was something I did not expect–I was already excited just to attend the celebration. 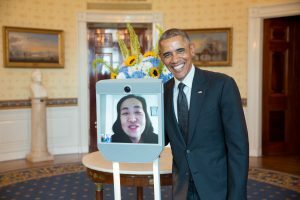 My memory is a bit blurry on what I said to President Obama, it couldn’t have been more than 10 minutes but he was definitely interested in my presence as a robot. I got a chance to demonstrate how I could move around and near the end we posed for a photo. A copy of that photo is now framed and hanging in my living room. It’s a priceless memento of an unforgettable experience. Many disabled people right now are using assistive technology allowing them to participate fully in society. Here are three examples: PhD candidate Kavita Krishnaswamy uses the Beam Pro to present at conferences and interact with colleagues from home. Jessie Lorenz, Executive Director of the Independent Living Resource Center of San Francisco, uses Aira, smart glasses that help blind people navigate the world in real-time. Lateef McLeod uses Proloquo2go and Proloquo4Text apps on Apple devices to help him communicate. If you want to learn more about Jessie and Lateef’s story, check out my podcast episode on assistive technology (audio with text transcript). I wrestle and think about the privileges I have when it comes to access to technology: I can afford a smartphone, laptop and broadband Internet services. I don’t face accessibility barriers when using YouTube, Twitter, or Facebook. I am able to access and process online content with relative ease. I wish all disabled people have what they need in order to live the lives they want. The realities of poverty, ableism, the digital divide, and many other factors keeps assistive technologies, services, and devices from the people who can benefit from them the most. In an ideal world, I’d buy a Beam Pro for myself but that is way out of my budget. Even if I had one, I’d need to make arrangements to ship it to the location and have someone on-site set it up, charge it, and ship it back. For people who use it as part of their work or education, I hope this is considered a reasonable accommodation if requested. Outside of work or education, there are so many other uses for a telepresence robot–meeting up with friends, travelling, enjoying life outdoors. All technology is assistive technology–the term itself may be outmoded someday. So many products that exist now were never developed specifically for disabled people are used as such. I love the blurring of these boundaries, pushing the idea of universal design and accessibility to all design, not just stuff meant for rehabilitation. I had a great time being a robot. This is one of my assistive technology stories. What’s yours? You can record your story for the Disability Visibility Project® if you are interested or Tweet me @DisVisibility!